Vegetable Gardening is a Crime? Only in America! 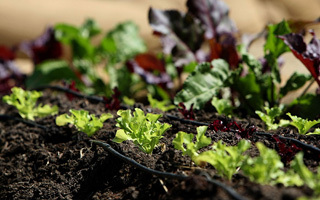 We hope We want to see MORE veggie gardens in people’s homes, not less! From ABC news: Julie Bass faces the prospect of going to jail for what she’s growing in her front yard. The illegal growth is tomatos. And zuchinis, peppers and other edible and what normally would be legal plants. The officials in Bass’ hometown of Oak Park, Mich., have charged her with growing “vegetable garden in front yard space.” If convicted, she could spend up to 93 days in jail. Bass said that the criminal charge “blew my mind.” “Sometimes we laugh because it seems so silly and sometimes we cry because it’s so pathetic. A lot of times it does not seem real,” she told ABCNews.com. Bass has insisted on a jury trial and a pre-trial hearing is set for July 26. If the case goes to court Bass’ attorney Solomon Radner does not believe that a jury will convict his client of a crime. “Michelle Obama plants vegetables on White House front lawn. I don’t think the jury is going to think that it’s suitable for the White House, but it’s not suitable for Oak Park,” said Radner. The first lady’s office, which is encouraging growing fresh vegetables to help fight childhood obesity, declined to comment on the Oak Park vegetable case. Bass got the idea to plant a garden in front yard after it was torn up over a busted sewage pipe. Next post: Would You Like to be Holidaying in Bali Next Month?